I have tried several Pineapple Upside Down cake recipes, and this recipe is hands down, the best one! 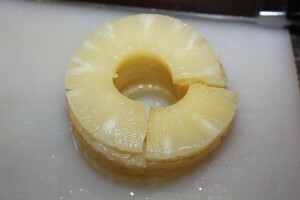 Not only is the topping rich and delicious, but the cake itself has the perfect amount of moisture combined with a firm texture to hold up to the pineapple topping. Best of all – there is no cutting required – each mini cake is an individual serving, so that means no fighting over the biggest piece! Fill the rest of the tin with the cake mixture. This dessert is an easy to travel treat as well. No knife required, and if you place it on a heavy cardboard slab lined with aluminum foil, there is nothing required to bring home with you after that get together. What a great surprise for those end of the school year parties, teacher appreciation days, or even that Friday potluck in the office. 1. Spray your muffin tins with non-stick cooking spray. 2. In a mixing bowl, add eggs, white sugar, and pineapple juice. Beat on medium speed for 2 minutes. 3. In a separate bowl, sift together the flour, baking powder, and salt. 4. Add dry ingredients to the wet ingredients and turn mixer back on for 2 minutes. 5. In a small sauce pan, melt the butter and add the brown sugar. Stir on low heat for one minute. 6. Spoon a layer of the warm brown sugar mixture into the bottom of each muffin tin, then place a pineapple ring on top. *If you are using regular muffin tins, you will need to cut down the rings to fit or use pineapple tidbits. 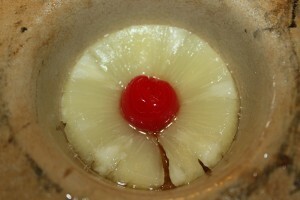 Add a cherry in the middle of each pineapple. 7. 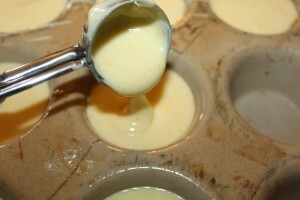 Pour cake mixture over the pineapples to fill each muffin tin 3/4 of the way full. 8. Bake jumbo cakes for approximately for 25 minutes. Bake regular cakes for approximately 20 minutes. The cake is done with a toothpick inserted in the middle comes out clean. 9. Remove from the oven. Cool in pan for 3 minutes. Run a knife around the edge of each cake to help loosen in case it sticks a little. Place a wire cooling rack on top, and quickly flip over on top of baking sheet to catch extra drippings. Serve warm or cool and store in an air tight container. ← Preparing The Garden For Planting Day – And The Importance Of Doing What You Love!